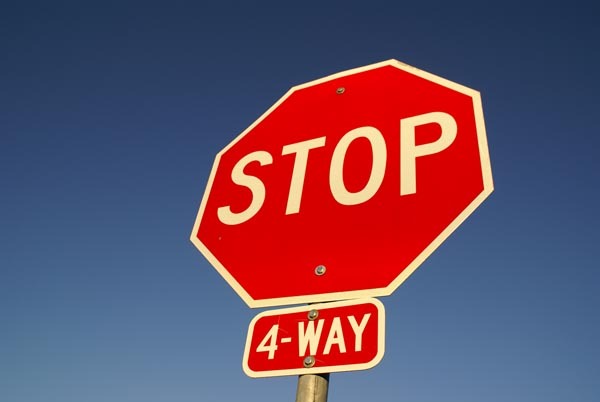 On a road I ride daily from work, there is a particular 4-way stop. It lies within a residential neighborhood, maybe even a little snooty for the likes of me. The direction in which I travel is level but the cross street climbs a very steep hill, not unlike the streets you see in San Francisco. Just as I began to increase the throttle and release the clutch, a full-size van barreled up over the hill, blew through the stop sign and continued up past me. The drivers were young kids who had no idea what they had just avoided. Had I drove normal, I would have been T-bone in the intersection and badly injured if not killed. One car had pulled to a stop across from me and we had both jammed on our brakes to stop when we saw the van appear out of nowhere. The lady driver’s eyes were shocked to full open and I made a gesture as if wiping the sweat from my forehead and let out a “whew”. Today at the same 4-way, I started out into the Dead Man’s area just as a little Honda appeared from down the hill and without stopping turned left in front of me. The driver, a little old lady, stared at me all the way, never touched her brakes, and gave me a crusty as if I was in the wrong. In this case, she traveled slow enough (hill + Honda + old lady driver) that I was able to veer out and brake to let her turn and travel in front of me. I followed the lady for several miles before she turned another way. She never looked back as far as I saw and if she did, I doubt it would’ve been to apologize. I was angry both times, but that does no good. Instead I hold reinforced some rules of riding motorcycles. No one sees you and if they do, it won’t alter their direction or decisions. Trust your instincts. If you think you should wait, wait. If you think you need to speed up, speed up. The brain is doing things of which we have no understanding. Trust it. Always watch and know where your escapes routes are. The brain will use them faster than you think (see rule above). Despite the risk and close calls, riding the bike is still better than being in a cage. Thanks. Funny thing, it is the road less traveled. I’ll just be even more cautious.